A lighthearted love story with a charming dose of fairy tale, the delightful Vivian Hsu plays a girl who is completely enamoured with shoes. One day, she meets her "Smiling Dentist" prince charming and they seem destined for a happily ever after journey..but do they? How nice would it be, if everything in the world looked perfect and pretty? Actually, you may want to think twice about that, especially after watching this Taiwan film directed by newcomer Robin Lee. Earlier in March this year, Hong Kong Heavenly King Andy Lau led a group of up-and-coming Asian directors under the Focus: First Cuts banner to produce a series of high-definition feature films. 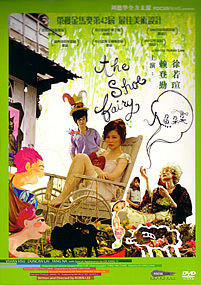 Kicking off the five features was this 94-minute flick starring popular Taiwanese singer Vivian Hsu. Hsu plays Do Do, a sweet young thing who grew up listening to fairy tales. The problem is that her happiness is not complete because she cannot walk. After a miraculous operation on her feet, she began loving shoes of all shapes and designs, and starts buying lots of them. She then meets Smiley (played by another pretty face Duncan Lai), and marries him. For the sake of domestic bliss, she gives up buying shoes. As fate would have it, Do Do meets with an unfortunate accident and her worldview is changed drastically. Seems like a hopeful and inspiring movie, you say? To some extent, that is true. There is also no doubt a quirky film, but it may be too quirky for some people. And alas, the movie also seems to be more concerned about producing shot after shot of picture-perfect images. The aesthetics in this movie are breathlessly good-looking. Wang Yi Fei, who clinched the Best Art Direction honour at the 42nd Golden Horse Awards, managed to make everything in the film look so artistically astounding and flawlessly amazing. Every scene is perfectly lighted, every prop is properly placed, every colour in the movie is a joy to look at – it makes you feel like you are watching a theater production. Sadly, that goes for the cast’s acting too. Hsu and Lai are definitely eye candy, but their acting can be so stiff, or to push it, theatrical, you may lose yourself in only the film’s visuals and not care about its plot or the actors’ performances. But can this maintain your interest for 94 minutes? Highly unlikely, we’d say. So while this movie may not be everyone’s cup of tea, credit still goes to the fact that everything looks so good. And to be fair, the last bit of salvation does come at the end of the film, where you may break into a slight smile, knowing the “revelation” of Do Do’s fate. That is, if you are still paying attention to the screen. This Code 3 DVD contains only a trailer for the movie. There is a choice of Mandarin Dolby Digital 2.0 or Mandarin Dolby Digital 5.1, which does not really matter because you will only be focusing on the lush and pretty images, which are thankfully justified by this DVD’s visual transfer.